While the 2016 presidential election drones and drags along for another two months, you may understandably elect to choose another way to pass the time for fun and enlightenment, let alone distraction. But if Go Big Red, Bluejay basketball, the World Series and the Great Debates aren’t enough to take the edge off, then put aside politics and sports for awhile and take advantage of what the Metro art scene has to offer for the next three months. What follows is your annual Reader Fall Visual Arts Preview, brought to you by virtually all the prominent venues in this area of every size and shape. This schedule includes events and exhibitions in all media, none of which ironically seem to take sides or express a provocative POV in this most politically climactic year. While the listing below is not complete, it highlights key exhibitions. Check The Reader weekly for updates and individual gallery and art center websites for details and hours. Omaha’s largest art spaces, Joslyn Art Museum, KANEKO and the Bemis Center for Contemporary Arts have much on their plate this fall, including key fundraising events for the latter two. Kicking off the Bemis Center’s Benefit Art Auction, Friday, Oct. 28, is a two-week preview of the more than 250 pieces of art for sale in the silent and live auction. A members-only preview reception with exhibiting artists will be held Oct. 14 followed by a general preview and Open House/Open Studios, Oct 15. Patrons can expect the usual party atmosphere with hors d’evours, open bar, and live entertainment. Tickets will go on sale mid-September for $100 and $125 the day of the auction. All net proceeds from the benefit will go towards Bemis’ year-round residency program as well as its commitment to exhibition and community-based projects. KANEKO will sweeten its own annual fundraiser, Open Space Soiree, with a special exhibition, From the Collection: Passion and Obsession. The fundraiser commences Friday, Nov. 11, but the exhibition continues through May 6. 2017. Passion and Obsession will include ceramic sculpture, glass 3D and installations, drawings and paintings from international artists such as Viola Frey, Tony Hepburn, Leiko Ikemura, Jun Kaneko, Manuel Neri, Annabeth Rosen, Therman Statom, Goro Suzuki, Akio Takamori and Sunkoo Yuh. Not only is this an impressive draw deserving of multiple visits to this museum-quality exhibition, Soiree will also feature epicurean delights from The Grey Plume which will serve “one of a kind flavors using seasonal ingredients to parallel the exhibition’s themes of passion and obsession,” according to an event statement. Tickets and details can be found at thekaneko.org/soiree. Joslyn will open three promising exhibits the first week in October, all of which will continue to about the first of the year. David (Shannon) Goes to the Museum (10/1/2016 – 12/31/2016) will include paintings and cover art for many of Shannon’s acclaimed books including No, David! and other David stories, including Alice the Fairy, Bugs in My Hair, How Georgie Radbourn Saved Baseball, and A BIG Fish Story, among others. Hayv Kahraman (10/8/2016 – 1/8/2017), which will show in the Riley CAP Gallery, draws on sources including Renaissance painting, Japanese woodblock prints, and Persian miniatures to create work that considers the repercussions of being displaced from one’s home. 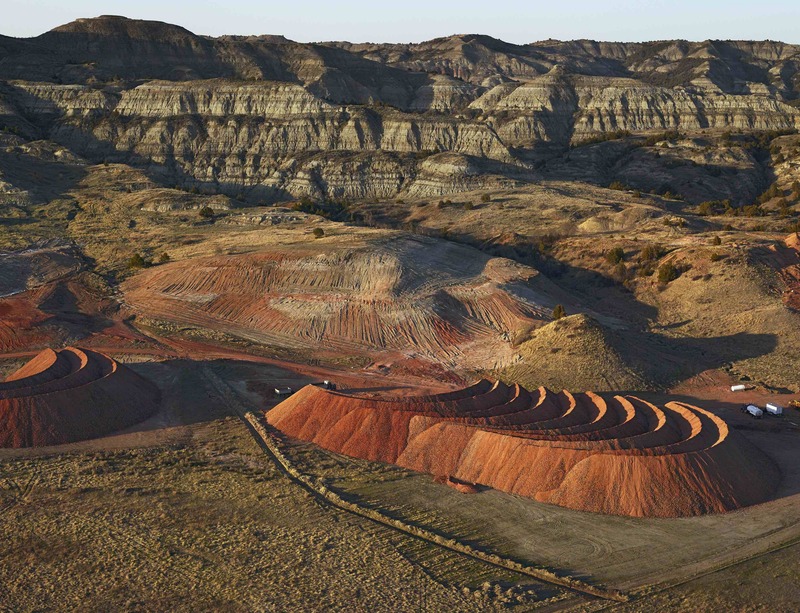 Joslyn’s most prominent exhibit this Fall will be Dirt Meridian: Photographs by Andrew Moore (10/9/2016 – 1/8/2017). During the past decade, Moore made over a dozen trips to photograph along the 100th meridian from North Dakota to the Texas panhandle. Photography is also prominent at another museum, El Museo Latino, currently featuring Anacronías / Anachronisms 1984 – 2015 by Ygnacio Rivero, which continues through Oct. 29. Rivero includes a selection of 30 black and white as well as color photographs that he has taken between 1984 and 2015, all of which share a common human experience: how the passage of time influences how we remember images from the past while looking at them in a new way. The public sector continues its strong presence in the Metro with promising exhibitions planned in the Fred Simon Gallery of Nebraska Arts, the Michael Phipps Gallery of the Omaha Public Library, Creighton University’s Lied Gallery and the UNO Fine Arts Gallery. The Fred Simon Gallery presents Comedy for All, Tragedy for None, curated by the very active in the arts, Alex Priest. The exhibition runs from Sept. 2 to Oct. 28, and it includes artwork from Omaha artists Sarah Jones, Norman Melichar and Dawn Smith. Priest describes the work as “Exploring the obtuse nature of nothingness. Comedy for all, Tragedy for None hesitates to directly identify meaning or intent.” If nothing matters, the exhibit challenges, “Then, what’s the point?” Despite the alt premise, you will still have to see the work to answer that question. Following such successful exhibitions this year as The Fractured World and Self-Governance, the Michael Phipps Gallery will feature two group shows: Science Future, Sept. 9 – Oct. 30, a multimedia exhibition featuring the scientific and futuristic visions of Travis Apel, Launa Bacon, and Regan Pufall; and In Social Geography, Omaha-based artists Camille Hawbaker and Gerardo Vazquez explore collective identity through a shared sense of oneness and language. In a striking, counter-intuitive fashion, the UNO gallery takes the lead with Sensory: Please Touch the Art, opening Thursday, Oct. 6 and closing Nov. 10, 2016. Multi-media artist and instructor Jamie Burmeister, the curator, says the exhibit “challenges artists to create works that invite visitors with low or no vision to experience artworks using all the senses. In a more traditional vein, the Lied Gallery offers two solo exhibits: Kristin Pluhacek: Drawings which opens Sept. 9 and continues till Oct. 9: and the oil paintings of Rachel Mindrup in Portrait of a Disorder: Neurofibromatosis, which runs from Oct. 24 to Nov. 22. Artist receptions are planned for Pluhacek, Friday, Sept. 9 and for Mindrup, Oct. 28. Both events are from 5 p.m. to 7 p.m. The private sector also has several worthy candidates for your consideration this fall beginning with offerings from such alt venues as Project Project and Darger HQ on Vinton St. and Petshop Gallery in Benson. Project Project, enjoying its second year of exposing emerging artists from the region, will host yet another curatorial effort from Alex Priest in October and exhibit Lincoln artist Nancy Friedman in November. Three or four doors east on Vinton in its new digs, Darger HQ will exhibit a two-person show, Oct. 17 to Dec. 17 featuring the art of Kristina Estell and Michael Ian Larsen. Estell creates sculpture, installation, interactive and watercolor works that generate sensitive and dynamic material experiences. Larsen’s art balances an innate interest in the organic with contemporary sculptural practice, creating installations that engage space and perception. Between PP and Darger HQ on Vinton we have the veteran art venue Gallery 72 gearing up for Empty and Full, a collaboration of two Omaha established artists, Jess Benjamin and Susan Knight, with strong credentials in 3D objects and the water environment. Empty and Full opens Sept. 9 and closes Oct. 1, and it features Benjamin’s ceramic sculpture and Knight’s hand cut 3D concepts that, combined, continue their mutual interest in water rights, protection and pollution. In the downtown Metro area, the Moving Gallery, Gallery 1516 and the RNG Gallery in Council Bluffs are planning a variety of exhibitions that celebrate both emerging and established regional and national artists. The Moving Gallery will open its Garden of the Zodiac space to two significant exhibitions of photography: Alexander Bonham Carter, 9/22–10/21, the first solo exhibition by this Kansas City artist’s portraiture and still life’s; and on Oct. 27, New Mexican photographer David Michael Kennedy will exhibit his sublime palladium prints of celebrities, Native Americans and landscapes. Across the river, at 157 West Broadway in Council Bluffs, RNG Gallery has scheduled the provocatively titled group show, My God Can Beat Up Your God in October and a solo show by the late muralist Louis Grell, who was born in Council Bluffs in 1887 and died in Chicago in 1960. Grell worked as an instructor at the Chicago Academy of Fine Arts for five years and at the School of the Art Institute of Chicago (SAIC) for fifteen. One of the most anticipated exhibitions this fall season, Tubach + Tubach—Preservation, will open at Gallery 1516 with a member’s preview Oct. 6 and a public showing Oct. 7. As part of its mission to exhibit Nebraska and regional artists, often in cooperation with the Museum of Nebraska Art in Kearney, Gallery 1516 has been exhibiting several mid-career artists, many of whom who haven’t shown in this area in some time, and thus reintroduced to a younger audience. Patrons can anticipate another exhibition this fall at Midtown Modern Arts that also celebrates established artists with Nebraska connections. MAM presents its two-month Legacy, Nov. 4 to Dec. 30, that offers selections of painting and sculpture from the national retrospective tour of artist John Himmelfarb. The exhibit also includes work from Catherine Ferguson, Martha Horvay, Michael James, Stephen Dinsmore, Jean Gaudaire-Thor, Don Williams, Roberto Kusterle, Gary Day and Peter Hill. Yet another Midtown venue, Connect Gallery, will showcase two additional mid-career local artists, wife and husband Nancy Lepo and Dan Klima. Lepo will exhibit her striking pen and ink pointillism on paper and Klima his turned wood pieces, some functional, all of it fine art. The two-person show opens Nov. 2 with an artist reception Nov. 11, and closes Nov. 26.